Venison (a.k.a meat from game animals like deer, moose or elk) is not very common in your average North American grocery store. But, if you’re lucky, you may be able to find it at a butcher or (if you have friends who hunt) get some friendly generosity. When you can find it, it is totally worth it. There’s much more variety in Venison than many other red meats. While it is similar to beef, it is much more lean and the flavour pallet can range from very subtle to bold and gamey. It all depending on where the Venison is from, which lends to a bit of adventure (if you’re into this sort of thing). The hard part about cooking venison is that it is extremely lean – which means you can over cook it very easily and it will become very tough (ever eaten shoe leather? It can be that bad). Although cooking Venison can seem daunting (I know I had a tad bit of anxiety about over cooking it! ), you just need to make sure you keep an eye on it and use a meat thermometer to track it’s progress as it cooks. This technique was given to me by a family friend and it works great! Cooking a Venison roast (if you can get your hands on one) from frozen really helps to prevent drying it out – it helps you to not worry as much. 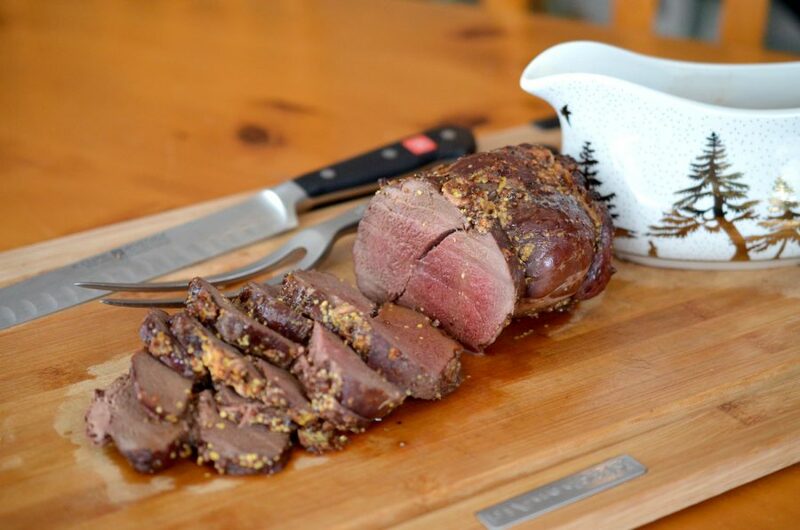 So, what are you waiting for – get some venison and impress all of your friends with your awesome skills (just don’t tell them your trade secret to cooking it). Preheat the oven to 350F. Place the frozen veal loin roast on a roasting pan. I know that it is unconventional, but it is essential that it is cooked from frozen to prevent drying out. Add the 2 cups of water to the bottom of the pan to prevent any drippings from burning. Top up with water as needed throughout the cooking process to always keep a thin layer of water in the bottom of the pan. Cook the roast for 30 mins. After 30 mins, remove from oven and cover with the mustard and seasoning salt. Place back in the oven for an additional 40-60 mins (depending on how hot your oven runs) until the temperature reads 120F. Remove from the oven and rest tented in tinfoil for 10 mins. Meanwhile, simmer the stock, beer, rosemary, cardamom, bay leaves, garlic, tarragon, lemon juice, salt and pepper. Once the liquid is about 1/4 the amount you started with (about 500 ml), strain the liquid into a bowl. Place the liquid back in the pan, add any drippings from the roast and remove from the heat. Add the frozen butter and whisk until smooth. Set aside. Thinly slice the roast after resting and serve with au jus. *As a general rule of thumb, when serving meats it helps to plan for about 1/2 lbs of meat per person when deciding how much you need.